An interesting paper on crowdsourcing just came out in the “Computational & Mathematical Organization Theory” journal. “Maximizing benefits from crowdsourced data” by Geoffrey Barbier et al. explores how crowdsourcing can be used for purposes of collective action and problem-solving, for example, in disaster response and by relief organizations. Besides being a very useful reference piece by providing a state of coverage with respect to crowdsourced data – like where to find it and what to make of it -, the paper is also a nice illustration of how social scientists become more and more involved in leveraging “big data” from informational infrastructures and from web activity in general. Crowdsourced data but also initially a lot less directed, if not accidental, information flows appear to increasingly be data-mined for a variety of purposes, not at least by – oops – us. Making good on disasters: Why did Google help Japan? 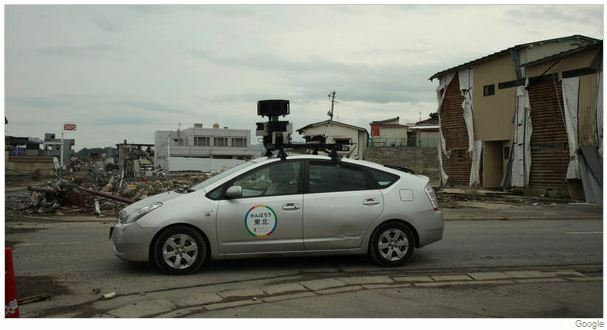 Google is using its Street View technology in Kesennuma and elsewhere to make a record of the disaster while tracking reconstruction efforts. An oddly equipped car made its way last week through the rubble in this tsunami-stricken port city. On the roof: an assembly of nine cameras creating 360-degree panoramic digital images of the disaster zone to archive damage. It is one of the newest ways that Google, a Web giant worldwide but long a mere runner-up in Japan’s online market, has harnessed its technology to raise its brand and social networking identity in this country. Google was also quick in the early hours of the disaster to assemble a Person Finder site that helped people learn of the status of friends and relatives affected by the earthquake and tsunami. It is important to note that Google cannot yet determine whether or not these efforts have helped them to crest the Japanese browser use market; however, that is far from what interests me. After studying the Tylenol Poisoning Tragedy (see chapter one of Minding the Machines:Preventing Technological Disaster) and many others, we ask: are there circumstances under which a firm might gain, over the long run, from a carefully handled crisis? Students, especially of the conspiracy theory bent, go nuts with this one, and reformulate my question: are there circumstances under which a firm might gain, over the long run, from a carefully planned and handled crisis? So, while I have no illusions that Google planned the Tsunamis in Japan, I wonder if non-local crisis response research and development might be a way answer the question above or shift the dialogue to such topics as “planned disaster response by for-profit agencies.” It seems as though organizaitons like Google with oodles of slack resources and a penchant for expansion might serve themselves well by expressing “social responsibility” during times of non-local crisis … especially, in nations where their product, service, etc. is not the leading brand, type, etc. Hence, almost sounding like a conspiracy theorist now, is it just a coincidence that Google reached out to Japan? Just like Nicholas I am very much interested in disasters, and his earlier post made me wonder some more about the connection to the issue of infrastructures. Some connections are obvious once you talk about technological disasters propers, especially if you approach the topic from a “normal accidents” angle (as Perrow in his treatise on normal accidents utilizes a general notion of networks including humans, technological artefacts, institutions, etc.). But there is also the whole literature about high-reliability organizations (HROs) which Nicholas alluded to in his second post on this topic, in which the focus is more on human behavior in high-risk situations and on “mindful organizing”. One common denominator between the various types of research and literatures on disasters and near misses is the emphasis given to relational structures and processes: Perrow’s notion of vulnerable systems is basically a conceptualization of networks the elements of which can be loosely or tightly coupled, and HRO authors like Weick characterize mindful behavior as “heedful interrelating”. Having been concerned with micropatterns of responding to disruptions in my own post-doc research, I am struck by the extent to which such responses are characterized by spontaneous forms of interrelating among participants, for example in emergent groups in communities struck by disasters. Furthermore, organizations coping with disruptions look more like networks than like hierarchies – a condition which HROs almost appear to emulate. Bottom line is, I think, that an extended infrastructural understanding of understanding disasters, near misses, high-risk situations, and so on, may be elaborated by more systematically discussing the various social and technological aspects of interrelating in extreme situation. Actually, there is a lot of research going on in this area right now since disaster researchers and disaster response practitioners generally tend to be quite aware about the relational aspects of responding to disruptions. Just this week, our local communicating disaster research group met for a workshop on the use of social media in crisis situations, and you may check out the outline here. Apparently, disaster response organizations increasingly ponder possibilities of utilizing people’s technologically augmented abilities of interrelating in real time: if you have people with smartphones present at a disaster site, and they will spontaneously interrelate in immediate disaster responses (like looking for survivors, moving debris etc.) anyway, while you as an outsider start with knowing nothing or very little about where and how to deploy your own helpers and machines, why not use survivors’ smartphones, their GPS and photo capabilities for coordinating disaster responses? The “disaster app” may at some point, perhaps sooner rather than later, become an obligatory smartphone functionality. As I am generally interested in “technological” disasters and write for an infrastructure blog, I always wonder about infrastructural disasters. Frey, Bruno S., David A. Savage, and Benno Torgler. 2011. “Behavior under Extreme Conditions: The Titanic Disaster.” Journal of Economic Perspectives, 25(1): 209–22. During the night of April 14, 1912, the RMS Titanic collided with an iceberg on her maiden voyage. Two hours and 40 minutes later she sank, resulting in the loss of 1,501 lives—more than two-thirds of her 2,207 passengers and crew. This remains one of the deadliest peacetime maritime disasters in history and by far the most famous. The disaster came as a great shock because the vessel was equipped with the most advanced technology at that time, had an experienced crew, and was thought to be practically “unsinkable” (although the belief that the ship had been widely believed to be truly unsinkable actually arose after the sinking, as explained in Howell, 1999). The Titanic’s fame was enhanced by the considerable number of fifi lms made about it: not including various made-for-television movies and series, the list would include Saved from the Titanic (1912), In Nacht und Eis (1912), Atlantic (1929), Titanic (1943 and 1953), A Night to Remember (1958), Raise the Titanic! (1980), and of course the 1997 Titanic, directed by James Cameron and starring Leonardo DiCaprio and Kate Winslet. In 1985, a joint American–French expedition, led by Jean-Louis Michel and Dr. Robert Ballard, located the wreckage and collected approximately 6,000 artifacts, which were later shown in an exhibition that toured the world. The results suggest when you compare the quick sink of the Lusitania (under 20 mins) to the show, gradual sink of the Titanic (over a 3 hour period), you learn something about the dynamics of self-interest under certain circumstances. The comparison between the Titanic and the Lusitania suggests that when time is scarce, individual self-interested flight behavior predominates, while altruism and social norms and power through social status become more important if there is suffificient time for them to evolve.